Mozilla Labs Gaming is the latest project launched by Mozilla labs. With Mozilla Labs Gaming, Mozilla intends to build games which is delivered and played on the Open Web and the browser. Through this, Mozilla wants to explore the wider set of technologies which make immersive gaming on the Open Web possible. 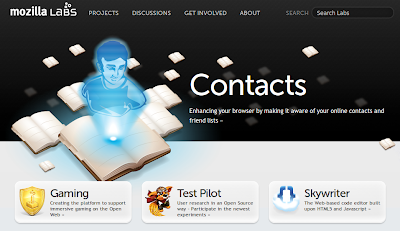 Test Pilot is a Mozilla Labs project to collect structured user feedback through Firefox. Test Pilot studies explore how people use their web browser and the Internet. If you are looking for ways to contribute and don't know where to start, Test Pilot is definitively the place you should think of. Test Pilot is an Firefox add-on you can easily install and configure. Prism is another Mozilla Labs project that holds a lot a potential for the future. Prism is basically an application that lets users to split web application from the browser and run them directly on your desktop. Contacts acts like a huge database of all your contacts. Contact is a simple add-on which seamlessly integrates with all you local and web based address books and bring all your contacts under one roof. Supported services include gmail, facebook, yahoo, twitter and many more. Previously called Bespin, Skywriter is a customizable programmer's editor, written for modern web browsers. With Skywriter, you can enable "coding in the cloud" on your website using Skywriter Embedded or on any website using Skywriter Bookmarklet. Personas is perhaps the Mozilla Labs project which most of you must be aware of. Personas are basically a bunch of Firefox themes which are quite easy to install and configure. There are thousands of Personas available with new ones added almost everyday.